Creating a value-add for East Washington neighbors that goes beyond additional parking options, BWBR is working with the City of Madison to design the first Parksmart certified structure in the region. BWBR partnered with GRAEF to design the new facility. Similar to LEED certifications for buildings that denote the energy, environmental, and air quality performance of a facility, Parksmart provides certifications to parking structures that enhance a community through efficient traffic flows, enhanced wayfinding, placemaking, longevity of the structure, lighting, stormwater management, and alternative transportation accommodation. The combined aspects of the structure help reduce emissions while also providing a durable, easily manageable facility. 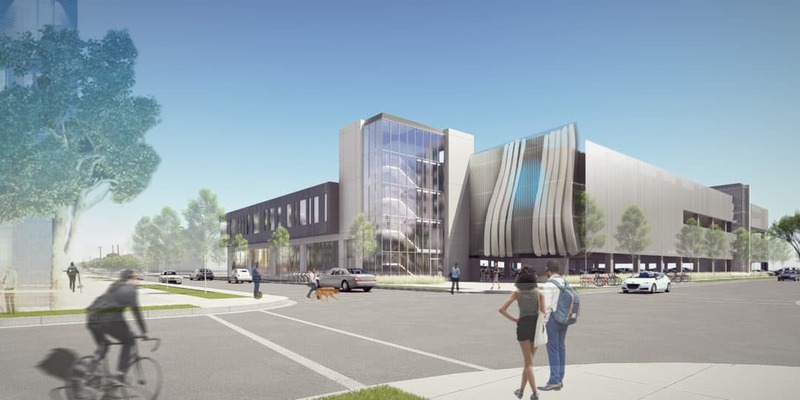 Known as the Capitol East District Parking Structure, the facility will be part of a larger development along the 800 block of East Washington Avenue. The parking structure will provide 675 stalls as well as commercial space supporting the redevelopment of the East Washington Avenue commercial corridor. The corridor is a redevelopment of several properties, including an MG&E property where the parking structure will sit. The corridor also includes Spark, home to office space for American Family Insurance and the StartingBlock collaborative entrepreneurial center, and the Cosmos, featuring a planned 2,500-person concert venue. The parking garage will provide off-street parking for businesses and entertainment venues, provide bicycle parking and sharing, reduce vehicle idling, and include preferred parking and charging for LEVs and electric vehicles. Construction began Oct 2017 and is expected to be completed Aug 2018.